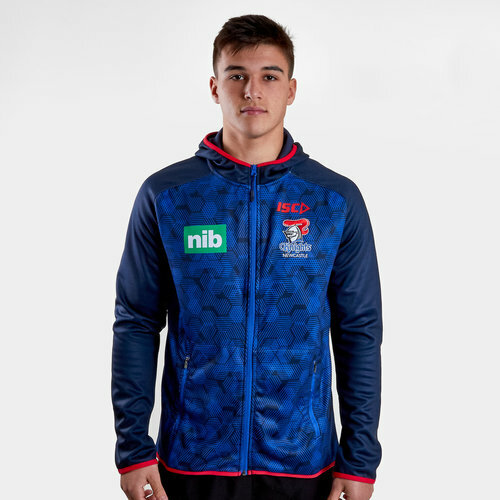 Showcase your passion for the Novacastrians when you pull on this Newcastle Knights NRL 2019 Players Hooded Rugby Sweat from ISC. Newcastle Knights play their rugby in Austalia's premier rugby league competition, the National Rugby League NRL. The club has won two premierships over its history (1997 and 2001) and is one of only two clubs (the other being the Wests Tigers) that has never lost a grand final in which it has participated. 2017 saw the Knights finish last claiming their third wooden spoon in a row with the 2018 season only slightly more successful where they finished 11th. Newcastle adopted 'The Knights' moniker as a reference to its ‘steel city' industrial heritage. The jersey colours of red and blue were adopted from the district's representative side that wore red jerseys, white shorts and blue socks. This zip-up hoodie has been crafted from brushed fleece. It has been cut in a contemporary design with simplistic styling throughout. It is navy with red detailing and an electric blue design across it. The ISC logo is on the left side of the chest just underneath the team badge.